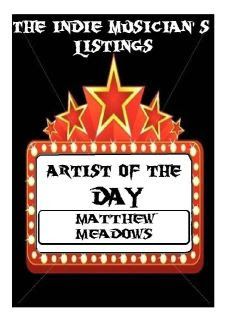 KBM Management (Promotion Page): Matthew Meadows - Artist of the Day !! http://www.reverbnation.com/matthewmeadows — with Matthew Meadows. Hello all you cool cats, Rango here. I bring the metalish from Seattle, the Emerald City, and I spread it around from the UK to LA. I'm a retired ballet dancer, a computer programmer, a singer/songwriter, a ReverbNation Seattle top-10 artist, and I'm currently recording bits as one of the villains in an opera called Liberteria. I released Etherati one year ago, a 100% solo effort, and I've been on a rocket ever since (burn, baby, burn), with multiple TV & film opportunities and collaborations with artists around the world in the ensuing months. Now I'm finishing up Temple of Zither, my 2012 album, and producer Stuart Epps is mastering the best tracks. Smokehouse, the lead song on the album, was Stuart's gift to me on Christmas Eve and we're kicking off 2012 with it because it's sticky & sweet, with just a touch of heat. Please head on over to CDBaby/iTunes/Amazon and pick up a copy so that I can continue to entertain you in more interesting and sophisticated ways in the future. And thank you so much for your support so far, it's really been quite amazing.